I have become increasingly aware of the antibiotics, growth hormones, and unsanitary practices involved in getting those perfectly wrapped steaks on the super market shelves. For about five minutes I attempted to purchase all organic meats for my family of six, and quickly realized that those costs were not feasible for our grocery budget. We grow our own produce, we raise our own eggs, so why can’t we raise our own meat? For starters, we have an acre. As much as I would love to add pigs, goats, and beef cattle to our homestead, there simply isn’t enough land to support large livestock. We dug into this issue a bit, and came to the realization that meat rabbits were the perfect fit for our small property. 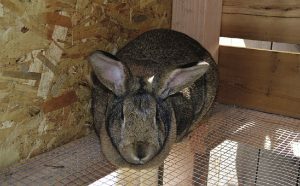 In fact, meat rabbits really are an ideal choice for any homestead or farm. A pair of female rabbits can supply up to 400 pounds of meat per year, which is about the same amount of meat that a cow will provide. Rabbits, however, use feed much more efficiently then beef cattle. Four pounds of feed is needed to supply one pound of rabbit meat, compared to seven pounds of feed needed to supply one pound of beef. Rabbit meat is also higher in protein, and lower in fat and cholesterol than beef, chicken, or pork. The Romans raised rabbits some 2,000 years ago, so this is by no means a new idea. Rabbit meat is surprisingly delicious, and very profitable if sold. Rabbit meat sells on average from $5-$10 per pound, depending on the area. The younger the rabbit, the more tender the meat. The ideal age to slaughter rabbits is 8-12 weeks. Once we decided to invest in meat rabbits, our personal choice was to get a breeding trio. This consisted of two does and a buck. In the meat rabbit world it is considered okay to breed fathers with daughters, but not brothers with sisters. We, however, did not want any relation at all in our trio, so purchased our rabbits from separate breeders. 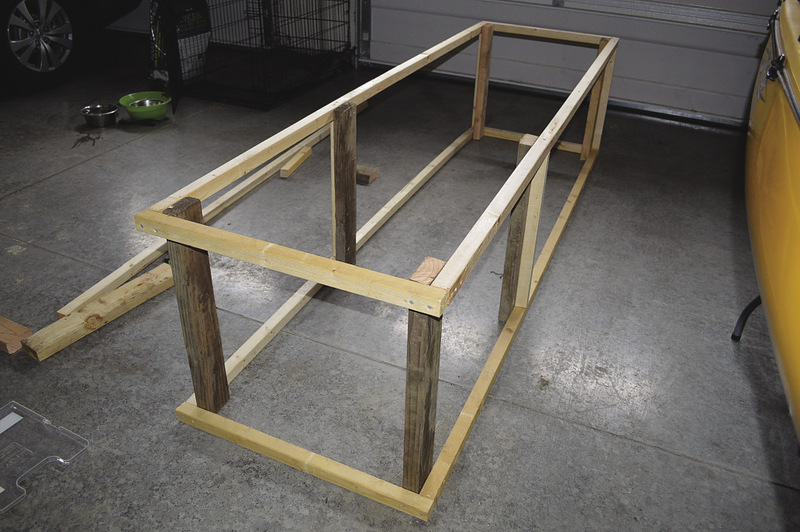 We made a three-part cage that measures approximately 10 x 2.5 feet. The frame is made out of 2 x 4s, and the back was old fencing boards that we had lying around. We try to use anything that we already have left over from past projects. The whole point is to save money. We had to purchase the 2 x 4s, the corrugated roofing, and the hinge and latch system for each door. The cage is built above ground to allow the droppings to fall straight through the wire floor. Adult rabbits live in the hutch year-round. Young rabbits live with their mothers until they are weaned, then move to the tractor to live together until they are harvested. We keep a trio of unrelated meat rabbits to breed. These are approximate measurements for our hutch, so if you plan to build one similar following these steps, please make sure to measure your own pieces carefully to your frame. You can substitute many of the materials we used for materials that you might already have, but this is how we constructed this particular three-hole hutch. The four outer corner posts are cut from two 4×8 posts. Two 52-inch pieces are the front posts, and two 44-inch sections are the back posts. The center posts are two 52-inch 2x4s for the front, and two 44-inch 2x4s for the back. The taller posts went in front so that we could create a sloped hutch and allow for rain runoff. The short sides are made from two 32-inch 2x4s. The front and back are made from two 10-foot 2x4s. We screwed the bottom frame pieces approximately 24 inches above the ground. This space allows for a tall cage for the rabbits, and a nice space under the hutch where the droppings fall. We wanted enough space below to make it easy to scoop out that wonderful compost. Once the bottom frame was attached to our corner 4×4 posts and our center 2×4 posts, we had a freestanding base that measured 2.5×10 feet. We designed the interior walls to slide in place. Some people use mesh walls, but this does not allow privacy for the does when they are nesting or when they have kits. If the male rabbits are bothering the does they will also spray urine at them. To avoid this, we used an old piece of plywood that we had for the interior walls. To make the slide-in system we cut three 2×1 20-inch pieces for the front posts, and six 2×1 15-inch pieces for the back posts. We screwed two pieces to the inside of each post leaving a ¾-inch space between them. For the plywood divider walls, we cut the ½-inch plywood sheets 21.5 inches in the front x 15.5 inches in the back x 26.5 inches long across the bottom. These simply slide into place between the attached 1×2 divider holders. This is where we created the slope for the roof. Three-hole hutch frame from front. The front wall is higher, allowing rain to run off toward the back. 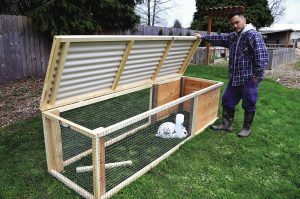 It also allows for a larger cage door, which makes accessing the rabbits and cleaning the hutch much easier. The rear of the hutch frame showing hardware cloth floor and divider walls installed. Note the 2×4 blocks installed in each corner to allow a surface to which the wire flooring can be attached. Installing doors. Wire will be stapled to the door frame. We had extra siding panels left over from building our chicken coop, so we used that for the siding pieces. Plywood or even cedar fencing slats would also work just fine. Those fit right into place, but a few small trims will probably be needed for a perfect fit. For the back we wanted some air flow so we used some old cedar fencing slats. 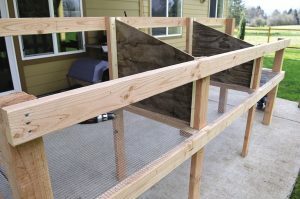 Rabbits tend to chew on wood so we did each hutch with its own boards so that they could be easily replaced when needed. The back of each hutch got two boards which were screwed into the frame. We laid each piece across the bottom frame in each cage, and stapled them into place. We made sure not to have any sharp edge sticking up. We wanted a roof overhang to provide the rabbits and interior of the cages more protection from the rain. We set our cross beams approximately 2 feet apart. 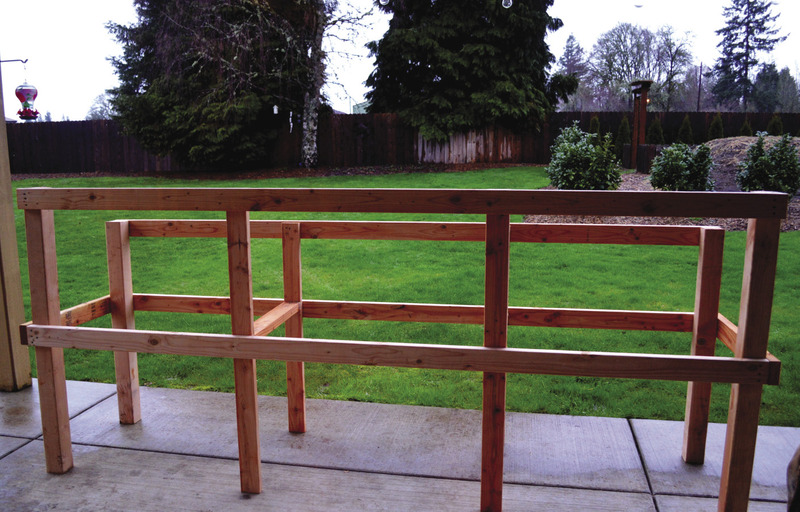 The back of the beams sits flush against the back 2×4 of the top frame, and screw in place. The front will stick out about 8 inches. Eight inches in from the front of each beam we cut a 2×2 notch so that it slides onto the front 2×4 on the frame. For a more finished look to the front of the roof frame, we cut a 2×4 into five 23-inch sections, and placed them in between the cross beams on the front so that we would have a clean flat surface going across. These were screwed into place. We overlapped each piece so that water would not drip between the cracks. This screwed onto the frame along the outside. We have 30×20 inch interior hutch doors on each of the three cages. We screwed the frames together and stapled the wire panels on the inside of the frame. We then attached each door using two hinges and a sliding latch. We used six total hinges and three latches. 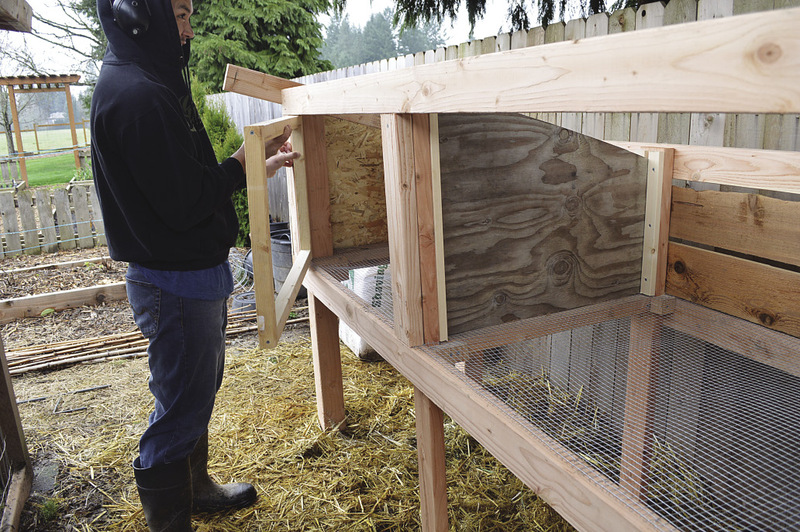 Note: Rabbits chew, so we used all untreated wood for the inside of the hutch. The wire flooring allows droppings to fall through, but it can also be hard on their feet. We provided a cage mat in each box for them to rest on. The basic rabbit tractor frame. 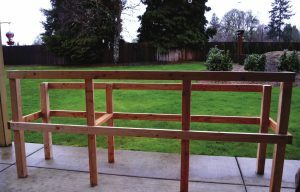 This end will be covered on three sides with thin wooden boards or plywood to create an area for privacy and provide more shelter from the elements. The rest of the sides will be covered with hardware cloth. Once we had the cage system built we also built a rabbit tractor that allows the rabbits to graze on clover or grass during the day. Grown rabbits can tolerate cold pretty well, but they do not do well in intense heat. The tractor allows us to move them into the shade during hot summer days. The kits, or baby rabbits, stay with their mothers for about four weeks, and then they are weaned and moved into the rabbit tractor until they are about five pounds, and ready to harvest. To build the tractor we chose 2x2s instead of 2x4s to make the tractor easier to move around the yard. There is a handle on each side for easy dragging. When eight kits are growing and grazing in the rabbit tractor, it needs to be moved every day to provide fresh grazing. The sides of the tractor are metal mesh, except the privacy portion that allows them to feel sheltered. 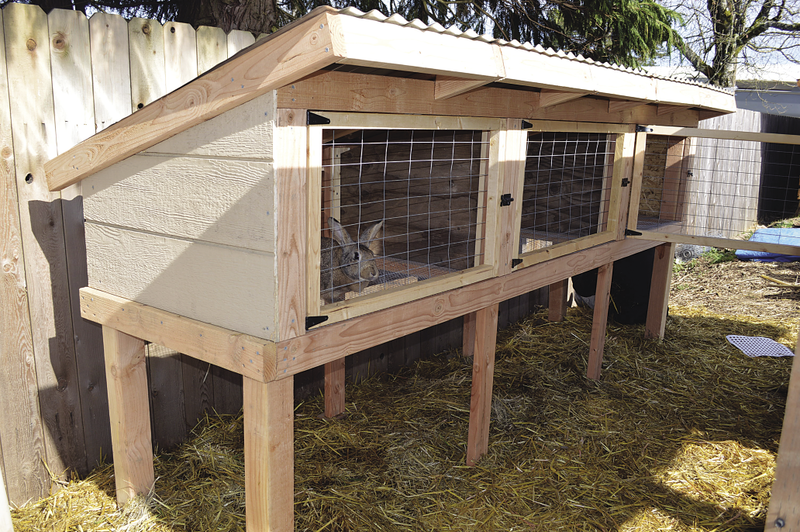 The roof is the same corrugated panel as the hutch, only it is hinged on one side to allow us to access the rabbits easily. There is also a latch on the roof to keep predators out. Six 2x2s 21-inches long make up the corners and divider area of the tractor. We set the divider 33 inches from the end. 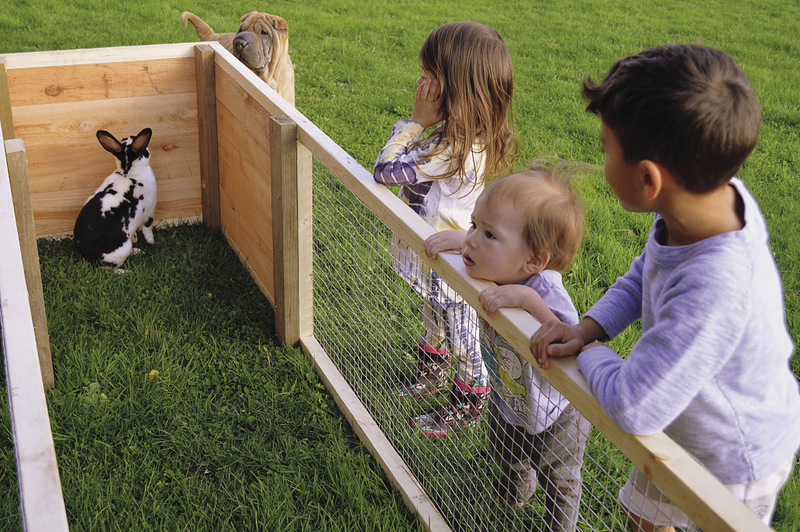 This area is designed for privacy, and a feeling of security for the rabbits to go into. It also gives protection from wind and blowing rain. To provide extra strength, we also secured 2x4s to the corners and divider pieces, but this is an optional step. We screwed six 2x4s cut at the same 21-inch height to the outside 2×2 frame. We screwed each piece into place, attaching the frame to the 2×4 support pieces. The siding is 1-inch metal hardware cloth that came on a 2 foot x 15 foot roll. We simply rolled it around, bending and stapling into place. We also added metal handles to the top of the frame for easy lifting. We used a few old cedar fencing slats that we had for the privacy section. All the top pieces had to be trimmed to fit in place. We screwed these to the outer frame. We screwed the outer frame together, and then screwed the cross beams into place, leaving equal distance between them. We attached the back of the lid’s frame to the back of the tractor frame using 4-inch metal hinges. We also attached a metal latch to the front to prevent predators from entering the tractor. The roofing is corrugated and cut into an 8-foot x 28-inch sheet and screwed into place. The roof frame is attached with hinges on one side and a latch at the front. Standard sizes of corrugated metal and plastic roofing fit these dimensions perfectly. 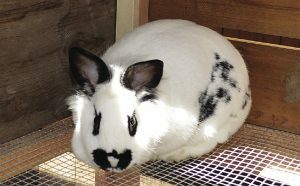 A female rabbit can be bred between 6-8 months depending on the breed. When you are ready to breed you take the female to the male. You know he “completes” his task when he falls over. Make sure to let them breed at least two times because a female rabbit has two sides, and each side needs a separate breeding to fertilize all of her eggs. They take 29-31 days to kindle, or give birth. The kits can be weaned at 4-6 weeks, and then the doe can be bred again. The litters range from 4-10, with the average being 8 kits per litter. These are highly productive animals that are quiet, provide natural meat, and produce garden ready compost. They are the perfect fit for families looking for a practical way to raise their own meat. Simple, inexpensive, home-built rabbit housing allows us to raise natural, healthy rabbit meat for our family. By John SilveiraWhen raising rabbits, it’s realistic to expect six litters of about six kits each from each doe. That makes 36 kits per doe per year. What weight should the kit reach before it reaches “fryer weight” and you process it? I’ve seen 4½ and 5-pound weights as ideal for fryers. Let’s settle on 4¾ pounds. Estimates are that it takes about 3.2 pounds of feed for each pound of fryer. That’s about 15.2 pounds of feed to bring your fryer to 4¾ pounds. I called around for the prices of feed. The most expensive was $23.99 and the cheapest was $15 for a 50-pound sack. (It pays to shop around.) Going with the cheapest, that’s 30 cents a pound for feed which figures to about $4.56 in feed to grow your rabbit to the 4¾-pound fryer size. The dressed carcass is going to weigh about 2½ pounds. The result is that you will have paid about $1.82 per pound for dressed-out meat. But keep in mind that when you try to estimate your costs, you also have to factor in what you’re spending to feed your breeding buck and does. This will bring your costs to about $2 per pound. How much meat does this all figure out to? The offspring from one doe will produce about 90 pounds of dressed-out meat for $180 a year. Two does, 180 pounds for $360. Three does, 270 pounds for $540. However, you can drastically cut your costs to less than one dollar a pound, by using garden and kitchen scraps to supplement their feed. But be careful, because there are many things, such as beans and cruciferous vegetables, you should not feed your rabbits or should only feed to them in small quantities. Learn what you can and cannot supplement their diet with. If you have access to a computer, one site to check out is http://www.bio.miami.edu/hare/diet.html.